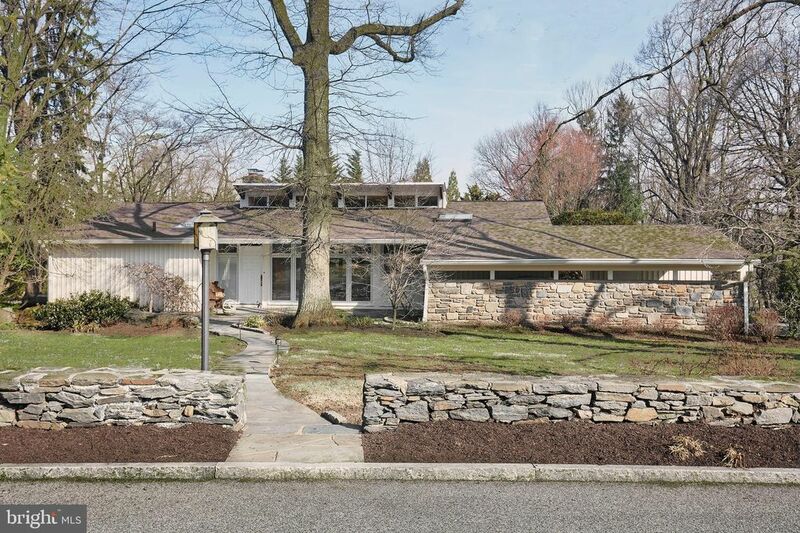 Extraordinary sun-filled Mid-Century contemporary, beautifully designed by Vincent Kling. Look no further and enjoy this bright home with freshly painted neutral decor, hardwood floors, a wonderful open floor plan, vaulted ceilings and large new windows, capturing private views at every turn. Spacious rooms include a white kitchen, breakfast room, fabulous great room with exposed beams, a wall of windows overlooking the breathtaking grounds, wood burning fireplace, sizable Dining Room, Sunroom, Expanded Master Bedroom Suite with luxurious Bathroom, two additional bedrooms and a second full Bathroom on the second floor, Lower Level 4th Bedroom with full Bathroom, Media Game Room and more. New roof in 2018. Absolute move in condition just minutes from Center City Philadelphia, renowned schools, shopping, restaurants, trains and more.